Over the years, we have learnt to trust Apple as a brand that produces high quality products that we all love to use. Their products feature the best-in-class designs, have elegant and innovative ways of interaction, and are mostly durable. Now, I say mostly here because there’s one particular piece of hardware from Apple that has consistently disappointed me ever since it was first introduced. I’m talking about Apple’s official lightning cable, the ones that ship in-the-box with iOS devices and the ones that are sold in Apple Stores worldwide. If you have owned an iOS device for a while, you might have realized by now that official lightning cables from Apple get damaged pretty easily. They aren’t quite what you’d recognize as quality products, even by non-Apple standards. The reason for such vulnerable lightning cables, according to a former Apple employee, apparently lies in Apple’s greater preference to Design over Engineering. And somehow, the Design team at Apple doesn’t quite like the appearance of strain relief used in conventional USB cables, which in fact, aids in their durability. Without strain relief, Apple’s lightning cables get repeatedly twisted at harsh angles, as a result of which they eventually snap. And in such a case, your friendly neighbor is less likely to have a spare lightning cable at their disposal, at least so compared to the probability of having a micro-USB cable. To relieve yourself from the crisis of not having a working lightning cable to charge and sync your iOS devices at all times, you must ensure to get a good quality third party lightning cable that is durable. And since you’re looking for third party cables, you must also ensure that they are MFi certified. 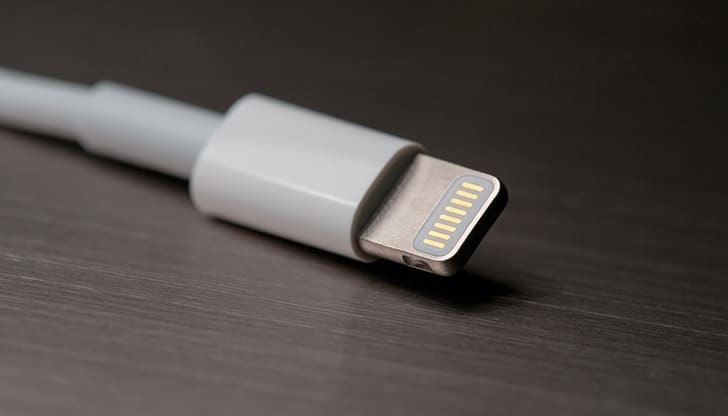 Below are some of the best lightning cables available in online stores from around the world. The aluminum-headed lightning cable includes steel spring relief at the ends and an exoskeleton braided jacket for better protection and durability. It also makes the cable tangle-free. Thus, you get total protection from any kind of damage. The company even claims to offer a “lifetime guarantee” on the product. The product is decently priced for its quality, and is available at 1 Feet, 3 Feet and 6 Feet variants. This lightning cable is available on Amazon and costs $19.95 for 1 Feet, $17.95 for 3 Feet and $42.74 for the 6 Feet variant. Shipping charges may be extra depending on your delivery location. The Anker Powerline features a kevlar fiber based core that makes it resistant against most damages. 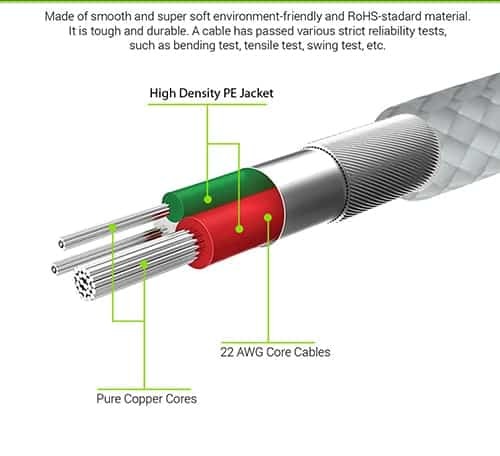 Stress points are specially strengthened with a combination of hard, protective PVC and soft, flexible PVC to make it up to 5X more durable than ordinary cables. Apart from build quality, the cable is also an impressive performer when it comes to fast charging and high speed data transfer. The cable is available in 3 Feet and 6 Feet variants. It is available on Amazon for $9.99 (3 Feet variant) and includes a 18 month warranty. With a protective braided jacket similar to the MOS Spring, Titan is “human proof, pet proof, everything proof. The cable uses industry-grade, flexible, high-strength steel, the cable is virtually indestructible against almost all kinds of forces. The company called Fuse Chicken started Titan from merely a concept. The concept was eventually turned into reality by a small team of people. The product featured in a video where its durability is tested against a chainsaw, a moving truck, hammer strikes, forced tangles, and more. Titan survives all those tests! The cord is 1 meter long and you can order it on Amazon, which will cost you about $34.95 a piece (plus shipping charges). The specialty of this cable is nylon braided cord with a weighted knot that anchors it to any flat surface, so it does not fall to the ground when detached from a device. 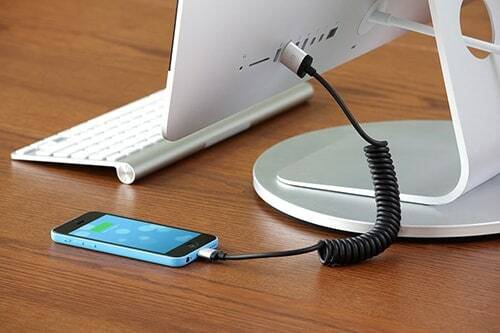 The cable is 10 Feet long, so you can charge your devices at a considerable distance from the power source. 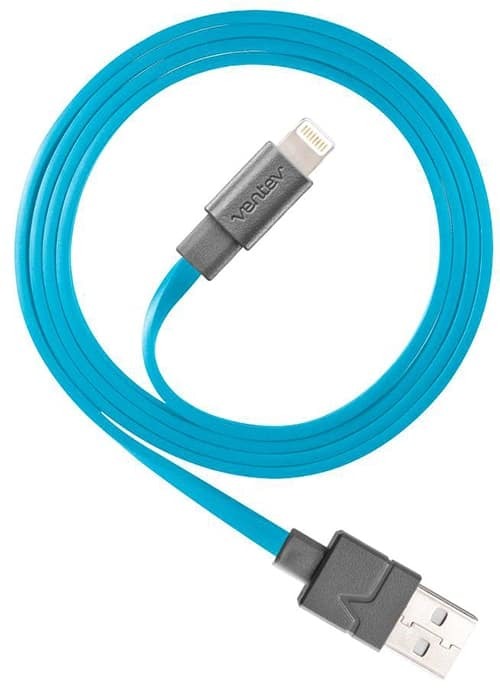 This lightning cable features a twist-coiled cable similar to the ones found on landline phones. The 6 feet cable contains aluminum-finished heads that give it a premium look. Overall, the product is durable and tangle-free due to its design. It is available on Amazon for $10.88 (additional shipping charges may apply). 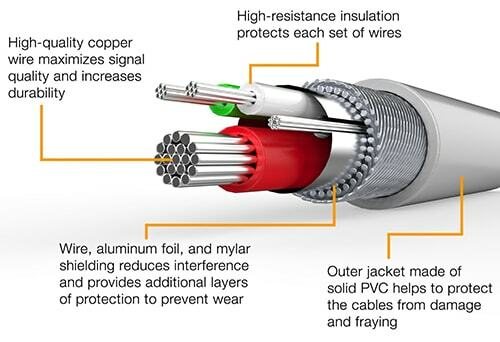 This cable features tangle-free nylon cord with aluminum casing and has a 4000+ bend lifespan. The product includes a 18 month warranty and is available on Amazon at $9.99 only. 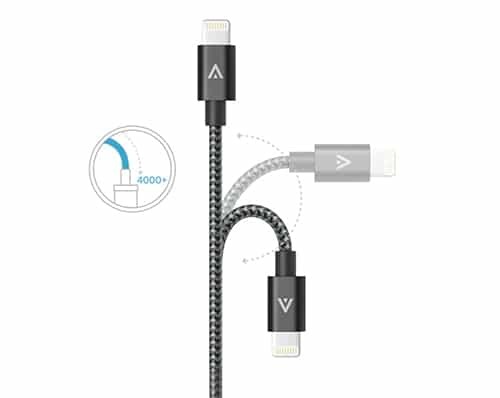 AmazonBasics Lightning cable uses a protective cord that resists damage, along with an additional protective layer at the two ends to improve durability and reduce fraying. Cables have been tested to bend 95-degrees 4,000 times. The product is available in 4 Inches, 3 Feet and 6 Feet variants, and can be bought as a single unit or 2-pack. It also has a limited 1-year warranty. You can order the product on Amazon, with prices starting from $5.99 (plus shipping) for the 4 Inch variant. This is a short-length data cable which features a flat, tangle-free design. Another specialty of the cable is that it supports rapid charging. You can order it from Amazon at prices starting from $17.99. 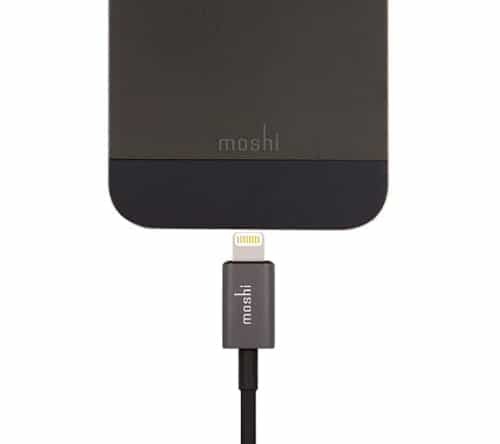 Moshi’s lightning cable is 1 meter long durable wire built to last. The USB and Lightning ends are encased in aluminum and shielded appropriately to reduce electromagnetic interference. You can order one of these products from Amazon starting at $15.59. Shipping and handling charges may apply depending on the delivery location. This one is especially recommended for Indian customers who want a durable lightning connector at an affordable price range. It is braided with “indestructible” PVC jacket strain relief to provide high durability. The braided, tangle-free cable is able to sustain up to more than 5000 bends and supports high speed charging and data transfer. Cable length is 1 meter and it’s available on Amazon India at ₹660 (~$9.88) assured by Amazon Fulfilled. 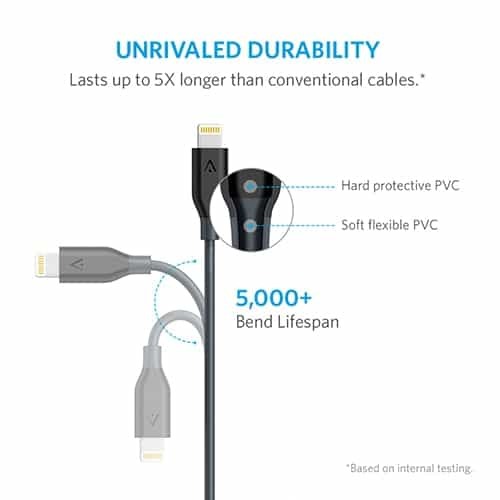 All the above listed lightning cables are MFi certified. However, If you decide to go with any other model, here is an easy way to check whether the accessory is actually MFi certified or not. Launch this URL on your web browser. Select the Search Criteria – Model, Brand or UPC/EAN. Specify your input based on the selected criteria. If the product is MFi certified, it will be displayed on the page. Apple also has an online guideline to help you identify counterfeit or non-MFi certified accessories. Of course, in the end, it’s up to you to decide which lightning cable is most convenient for you. You might want to go for a durable lightning cable that lasts long, or even use Apple’s lightning to micro-USB adapter to charge and sync iOS devices using conventional micro-USB cables. Which lightning cable do you prefer most? Give us your opinions in the comments below.